After breakfast takes a sight seeing tour of Bombay, drive to Gateway of India and from here cruise by motorboats to Elephanta Caves. A flight of 100 steps takes you to the top of the hill where it is set. The caves houses large pillars that seem to hold the ceiling which is made of cross beams. The picturesque presentations of the 9 marvelous sculptured panels, set on the walls are awe-inspiring. The most famous of the panels is the Trimurthi, or triple-headed Shiva, where the God is depicted as the destroyer, the preserver and the creator. Later in the afternoon cruise back to Gateway of India, one can have lunch at the Taj Hotel or other several good Restaurants like Leopold & Mondegar serving continental cuisine's. Later visit Prince of Wales Museum, Parliament House, Marine Drive, Jain Temple, Hanging Gardens, Return back to the hotel for overnight. Morning transfer to the railway-station to board the train # 7617 Tapovan Exp dep at 06:10 hrs and arr at 13:15 hrs. On arrival transfer to the hotel. 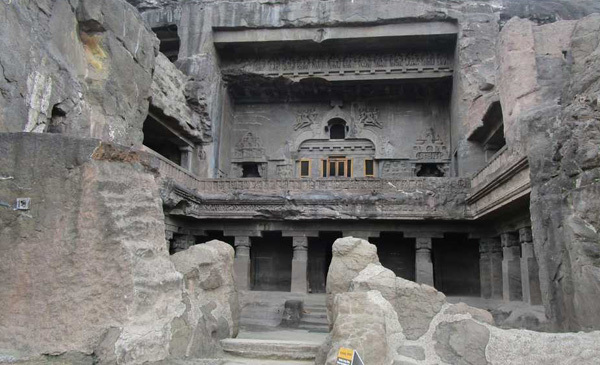 Later visit the Aurangabad Caves, excavated between the 2nd and 6th century AD, they reflect tantric influences in their iconography and architectural designs. Also visit and Daulatabad Fort, this magnificent 12th century fortress stands on a hill just 13 kms. from Aurangabad. One of the world's best preserved fort of medieval times, surviving virtually unaltered, Daulatabad yet displays the character that made it invincible. Overnight stay at the hotel.